Last night’s training was fairly heartening – after warming up and settling into position, I wound the foresight ring size down to the lowest my foresight would get to (it says 3.8mm, but I think it’s just under that), and found that I could not only hold with that, but hold steadily. and by ‘nice’ I mean that it allows you to alter not only the cant angle of those bars (which allows you to gauge the cant of the rifle and keep it consistent), but also the diameter of the foresight ring element and its thickness. 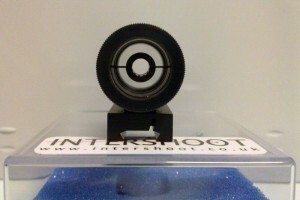 Now look at the gap between the ring element and the aiming mark in the sight picture diagram above; the larger the ring element, the larger that gap gets, obviously. What’s less obvious is that as your hold isn’t rock solid (because you’re a human and not a rock), it will look like the aiming mark is moving around in the ring element, and you can wind up subconciously attempting to muscle the rifle around to get things aligned as they are in the diagram above; but your muscles won’t allow you to do that — it’s too fine a motion for them to manage — and you’ll wind up overcontrolling things, and making the wobble even larger and it will continue growing until you’re nowhere even close to on target. We detect that wobble not by looking at the aiming mark itself though, but the gap between it and the ring element (it’s a funny by-product of how human eyesight works). 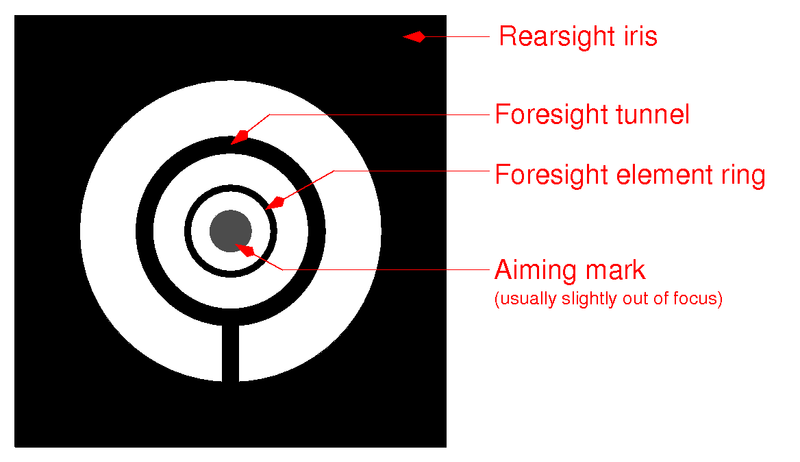 So if you open up the ring element, make it larger, the aiming mark won’t appear to move so much, you won’t attempt to muscle the rifle about, and you’ll get a more consistent position and thus more consistent shooting (and higher scores). 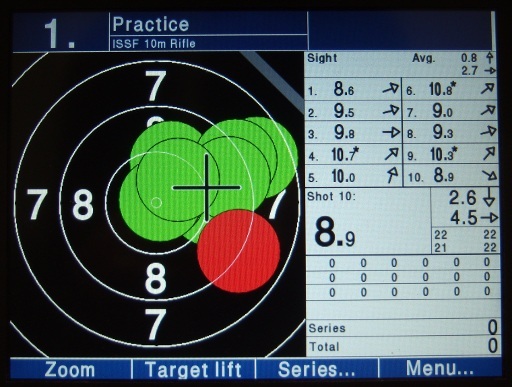 However, there are limits – if the gap’s too big, you can’t judge how centered the aiming mark is, and then while your hold will be better, your aim will be worse and the scores fall off. 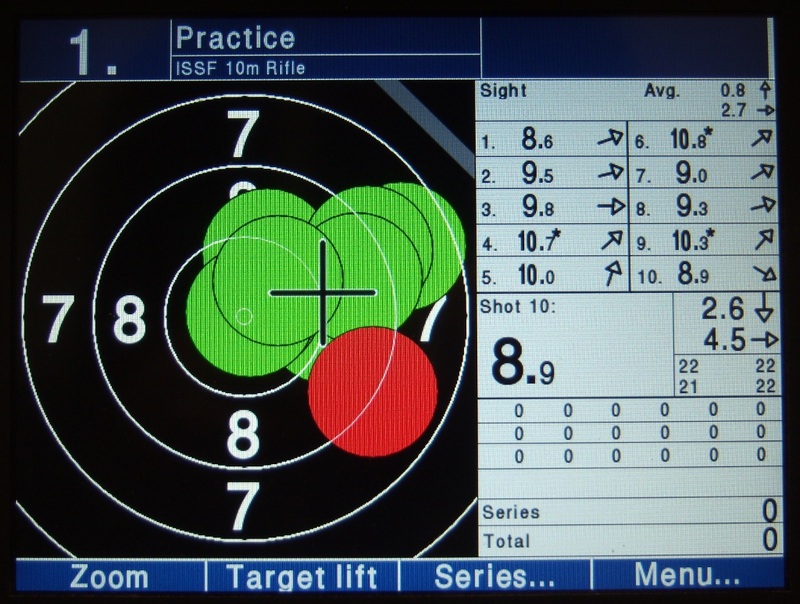 The optimal amount will be dependant on how good your hold is, and how good your hold is determines your score – strap a shooter into a noptel and most coaches can predict their match score to within a point or three from the data taken from one average shot. The lower you can get that optimal diameter for the ring element, then, the better your performance in a match will be. In DURC, we would usually start training people on a very large foresight – 4.5mm at the very least, 5.0mm if we could manage to find an element. And normally I’d train around the 4.2-4.5 range myself. Matt has me dialling it down as far as it’ll go at the moment though, so that we can see how good the hold is getting. I was expecting that at about 4.0 the hold would start getting shaky – but we managed to wind it down as far as the sights would take us (3.8ish) and no wobble spotted by then. I think we could have gone down as low as 3.6 before we’d have hit problems. (We won’t be shooting a match at 3.8 though, that’d be a bit silly. It’s a training exercise, not a match setup. 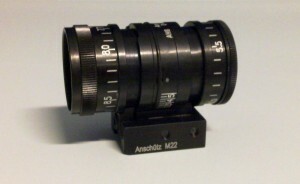 For matches, somewhere between 4.0mm and 4.4mm would be right, depending on the range’s lighting and other factors). 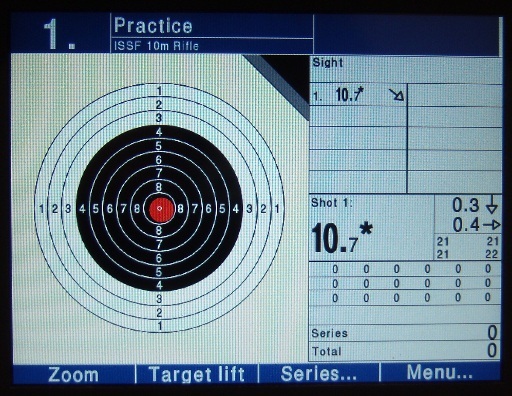 Posted on April 27, 2011 by Mark Dennehy in Training and tagged Air Rifle, WTSC. 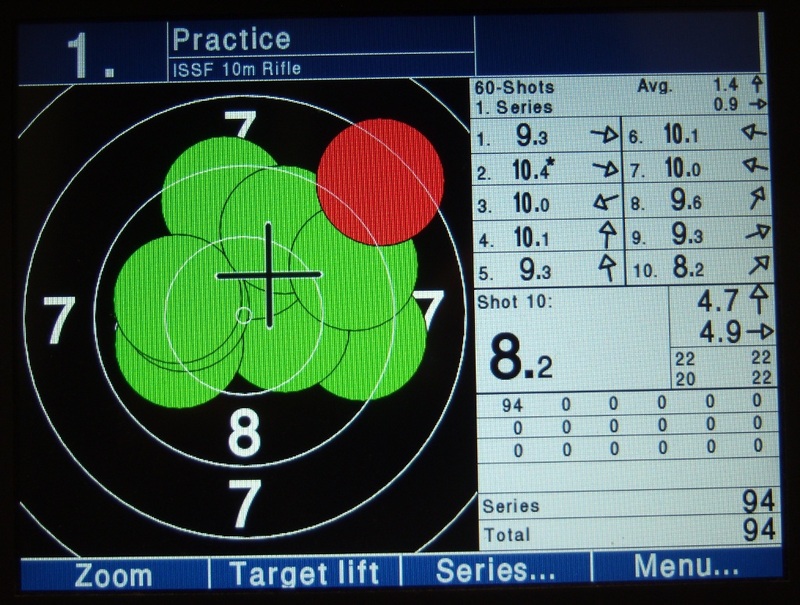 Over the last few weeks, I’ve had the Lanny Bassham mental management CDs playing in the car while driving about, in particular the FIRST CD, and one of the big points they make is on how shooters tend to become outcome-oriented in matches with great ease and how it utterly stuffs them up when they do. The training last thursday proved that right in a big way for me. 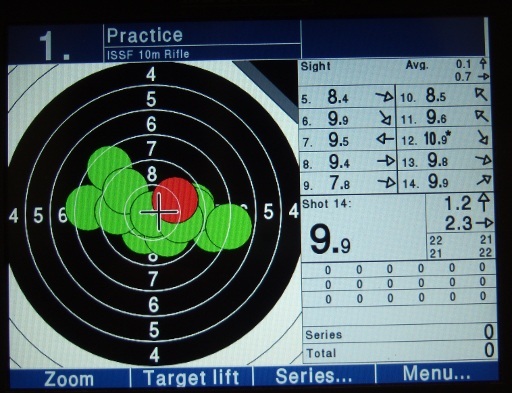 The idea was to get some video footage of my head position because one of the things I noted during the Nationals was that my sight picture was sometimes inconsistent – sometimes my head was closer to the rearsight than other times, and that’s been a problem in the past. One of those shots, we both agreed was off. One I said was on the margin and Matt thought was off. Both of those weren’t great shots, by comparison. 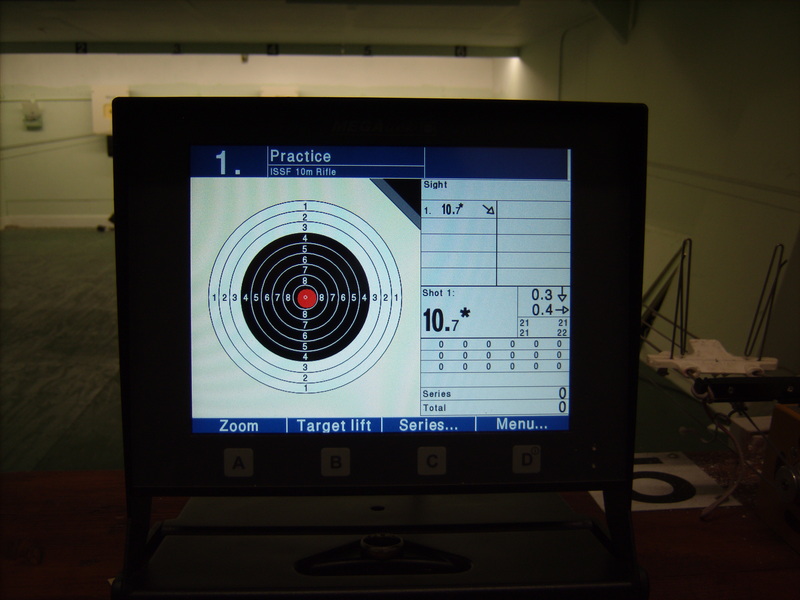 But all the others were good, with solid holds, rapid progression through the shot routine and aim times of under five seconds. A year ago, I couldn’t manage that for one shot. The process has much improved. 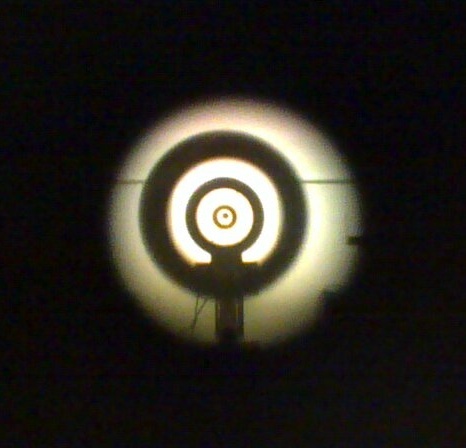 Now, ignoring both the irony of looking at the outcome in a post on how that’s a bad idea, and also ignoring a flier on the last shot (that lovely 8.9 in red that neither Matt nor myself thought was shot well), picture that central group if my sights had been set on target correctly – the group covers just under four ring diameters. 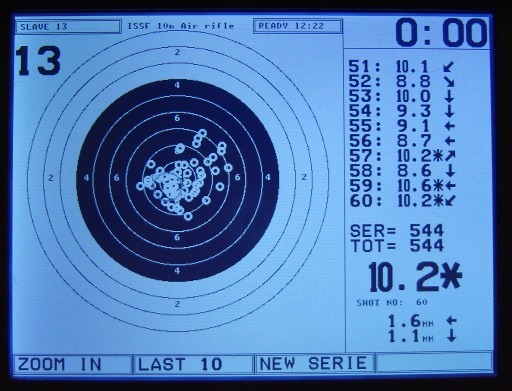 Centered, that means that all the shots would have landed within the 8 ring, which would translate to a score somewhere around 97-98ex100 (or about the 580 level in a full match). That’s shot without a stable jacket (in fact one that both fights me and gives me no support in position) and an old pair of trousers. This new position and shot routine have excellent potential. With some more weight loss and a new shooting suit, Tier 1 matches are well within reach in the timeframe I have set out and Tier 2 and Tier 3 matches would be within reach now with a new suit. Watching the screen, even though I’m not spotting it as it happens, is mangling my mental game in a fairly classical way. Specifically, I’m seeing the score come in and I’m then thinking “What do I need to fix to shoot a ten on the next shot?” instead of thinking instead “The next step in the shot routine is X and I need to be watching for Y before moving on past that step…”. When I couldn’t see where the shots were landing, my shot routine got better, my mental focus got better, and the end results got much better. What this means for training is fairly straightforward – finally doing all the dry-firing and wall-watching that Geoff and Matt have been advocating for years, but this time actually knowing why in my gut. 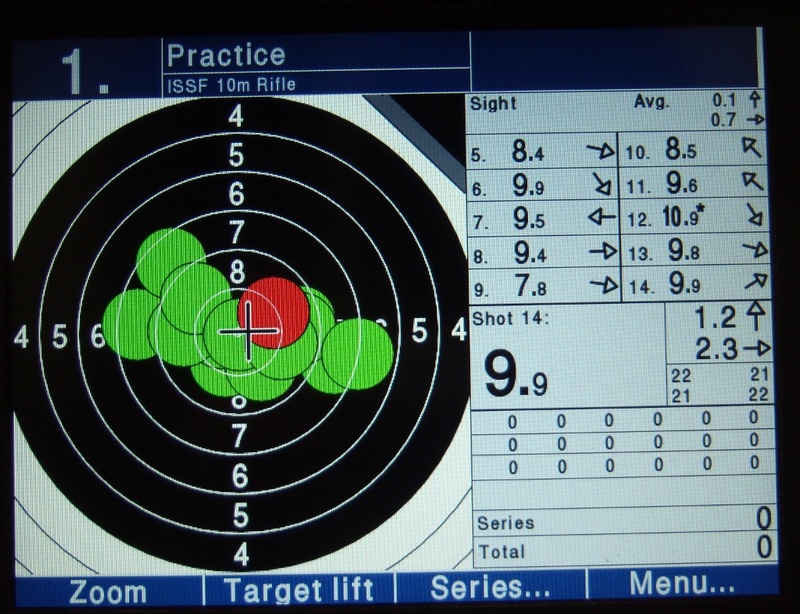 Posted on April 18, 2011 by Mark Dennehy in General, Training and tagged Air Rifle, WTSC.